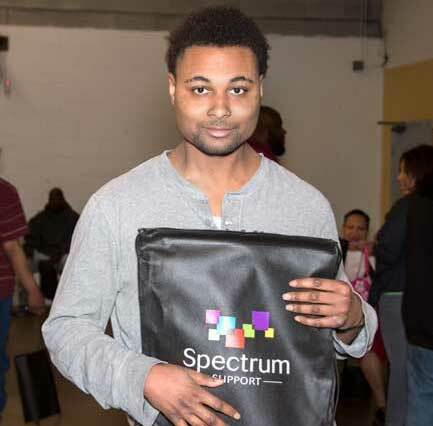 Spectrum Support, Inc. a 501(c)(3) non-profit agency, helps people with developmental disabilities such as autism, seizure disorders, mental retardation or cerebral palsy to live, learn, work and play in supportive communities. We provide supports in Baltimore, Columbia, Sykesville, Frederick, and Cumberland. We also provide services to people with developmental disabilities who reside in state psychiatric hospitals. Many of the individuals we support have a dual diagnosis that includes bi-polar disorder, schizophrenia or depression. Spectrum Support provides supports, primarily to adults, in a work setting, from their own homes, or to those who live with their families. The process of change comes about because of our unwavering belief in the inherent good in people. When we accept someone into our program we accept them unconditionally. We’ll find a way for the person to be successful. It may occur one step at a time, through repeated actions, or until we realize that the person is not progressing due to our not yet having found the correct way of supporting her/him – and we then try other ways until we develop the right combination of supports. We keep trying, and stick it out! The people we support are much like you and me. They want to be accepted; like to help others; like to have money and realize working is a good way to receive it; wish to be treated normally, and want to have friends, nice clothes, vacations, and regular lives. As a result, we talk about “supporting” individuals rather than “serving” them. Staff members state repeatedly that they like working with the individuals because they learn from each other. Thus, they strive to attain a level of mutual support rather than a top-down model of staff “teaching” individuals how to behave, read, do their job, and more. Mutual discovery of a person’s strengths and abilities is exciting. The more we can help people discover what it is they like about themselves, the more they can develop new horizons, new dreams and goals, and the more the community grows and benefits as well..